The Out’n About! user menu is available by double-clicking or right-clicking on any user on the In/Out Status Board. The user menu is used to display user information, send the user a message, synchronize the user’s contact data, etc. The administrator sub-menu is only available if you are an Out’n About! administrator. The change status sub-menu items are only available if the user is yourself or you are and Out’n About! administrator or receptionist. The In/Out Status Board displays information about each user in the system. The status board is the most important feature of the Out’n About! software. The status board contains one row of information for each employee that has been added to the Out’n About! system. Out’n About! displays the current status of each user in the system using the In/Out marker . This makes it easy to see at a glance whether a user is available or not. If you set an alarm to alert when the user has checked In, a small alarm icon will be displayed. The name column shows the full name of the Out’n About! user. Your information is displayed in blue text to allow you to quickly identify yourself on the board. Receptionist users have a single asterisk (*) after their name. Administrators have two asterisks (**) after their name. The status message column displays amplifying information about a user’s current status. There are a number of information columns that can be displayed for each user, such as phone number, department, fax number, etc. 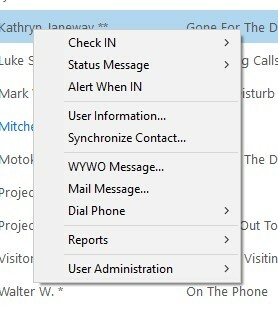 These columns are derived from the default Outlook contact data form and can be selectively displayed as you see fit. You can decide what information you would like displayed for each user to best fit your needs by selecting the column(s) to display on the In/Out Status Board. To select the columns you wish to include on the board, right-click on any of the column headings. The software will display a menu of the commonly viewed columns for quick selection. You can also select the ‘More…’ menu item to see all of the columns available for display. You can rearrange the Out’n About! columns so they are in the order you wish to view them. This way you do not have to scroll the status board to see the information that is important to you. Note: the default columns cannot be moved (i.e., status, name, and status message). To move a column, left click on the column header and hold down the mouse button. Drag the column to the position you would like and release the mouse button. You can sort the information on the In/Out Status Board by the contents of a column. You can sort text, numbers, dates, etc. in ascending or descending order. To sort a list in ascending order, click the heading of the column you wish to sort. To sort the list in descending order, click the heading of the column again. To quickly select a user on your Out’n About! board, type the first few letters of the user’s last name. If a matching name appears on the status board, it will be highlighted. This is useful for organizations with a large number of users on the board. If you are unable to find a user’s name on the Out’n About! status board, make sure you have selected ‘Everyone’ from the Department List and you have cleared any filters. Out’n About! allows users to be assigned to different departments within the company such as marketing, engineering, sales, or accounting. The Out’n About! Department Panel allows you to quickly select different departments for viewing. Click on any of the department names listed in the Departments Panel and the In/Out Status Board will only display the employees who belong to that department. The department panel also contains a filter dialog which allows you to filter users by different search criteria. The Out’n About! 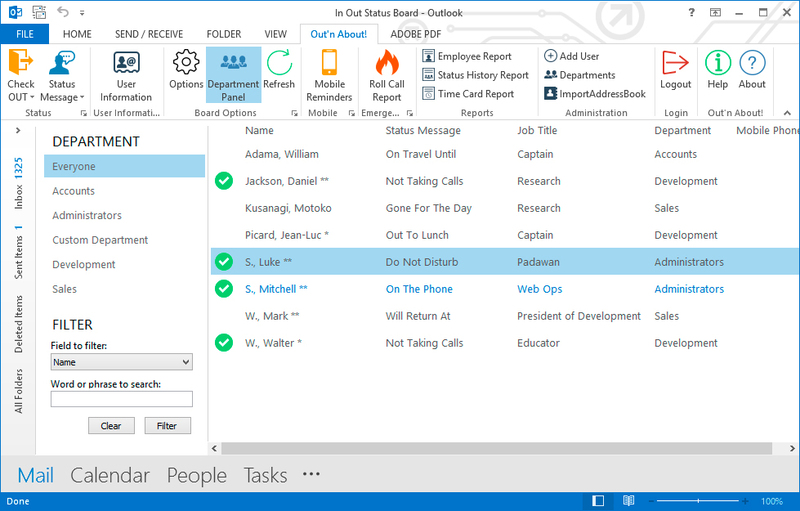 Department Panel can be turned off and on to provide more room for the In/Out Status Board, by selecting the ‘Department Panel’ menu item from the ‘Out’n About!’ menu.